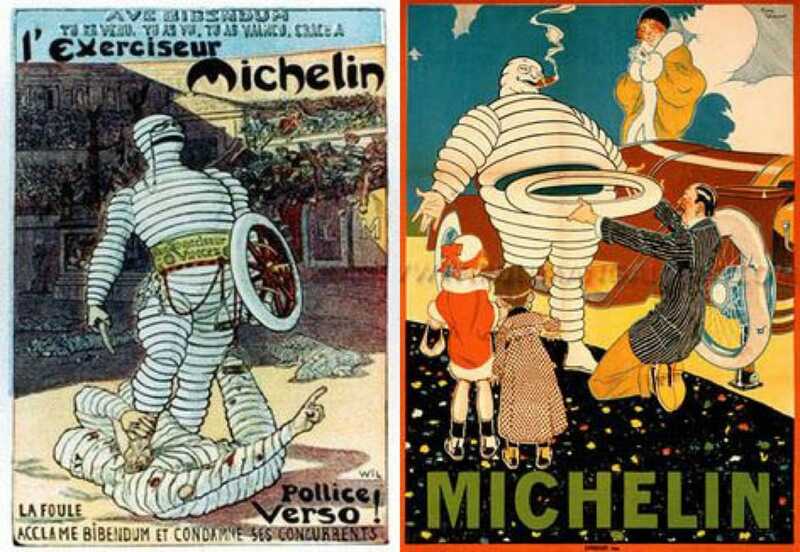 There's more to Bibendum—MICHELIN’s adorably puffy white mascot—than you may know. Widely-known as the “Michelin Man,” who has been the beloved face of the MICHELIN brand since 1898, the tubby white mascot’s name is actually Bibendum (or Bib for short). He even has a category for value-for-money restaurants in MICHELIN's guidebooks—the Bib Gourmand—named after him. Aside from the fact that a pile of tires at the 1894 Lyon Universal Exhibition inspired the look of this evergreen mascot (“Look, with arms it would make a man,” said company founder Édouard Michelin to his brother André), here are some other fascinating facts about Bibendum. 1. In his early days, Bibendum looked completely different. Instead, he once resembled a slightly creepy mummy-like figure and was often seen raising a glass in his ads with the words "Nunc est Bibendum,” Latin for "now is the time to drink.” This goblet was filled with nails and broken glass, which was meant to be indicative of how tough and hardy Michelin tires were, and that they would not puncture that easily. 2. Like most humans, he’s gone through different phases of life. In the early days, Bibendum was depicted as a gladiator, a kick boxer, a nimble ballroom dancer in the Italian market, and even a pleasure-seeking ladies' man who took to beer and cigars—the latter a touch added in an attempt to appeal to the wealthy upper-class folks who then had the money to purchase a car. But in the 1920s, he toned down and took on a more refined, family-friendly image: he quit alcohol, stopped smoking, and even started taking up sports (he's seen running and riding a bicycle while casually flinging tires like frisbees in several ads), shedding plenty of weight and looking more muscular than ever. In a poster from the early 1900s, he is even pictured assisting a family with a flat tire by donating the biggest, choicest tire from his own mid-section, as a blue sky shows through the hole left in his abdomen. Awww. 3. Tires weren’t colored black until 1912, thus, Bibendum is white. Prior to 1912, tires were either grey-white or had a light translucent beige hue. Carbon was subsequently added to the rubber formula as a preservative and a strengthener. 4. He owns an equally puffy white dog. Bibendum took on a similar-looking canine companion when the duo were CGI-animated for recent American television advertisements. His name is Bubbles and, like all pesky puppies, he ran away one stormy evening leaving Bib to search the forest for him. 5. He isn't much of a talker. Bibendum got his first—and only—speaking engagement in December of 1898 at a Paris cycle show: André Michelin had commissioned a large cardboard cutout of him to be set up at the Michelin booth, and instructed a cabaret comedian to crouch behind to provide animated banter. According to historic records, André had specified that he wanted someone with "perfect elocution," "keen repartee," and "wit without vulgarity.” The spectacle was said to have attracted such a large crowd that pushing and shoving ensued, and the police had to be called in to restore order. From the early 2000s, however, when Bibendum's commercials were everywhere, he preferred to stay mum. This was a deliberate decision made by advertising agency, Campbell-Ewald. "His silence is an artistic choice... he's the strong, silent type,” said the agency's creative director, John Stewart. 6. He’s quite the media personality. 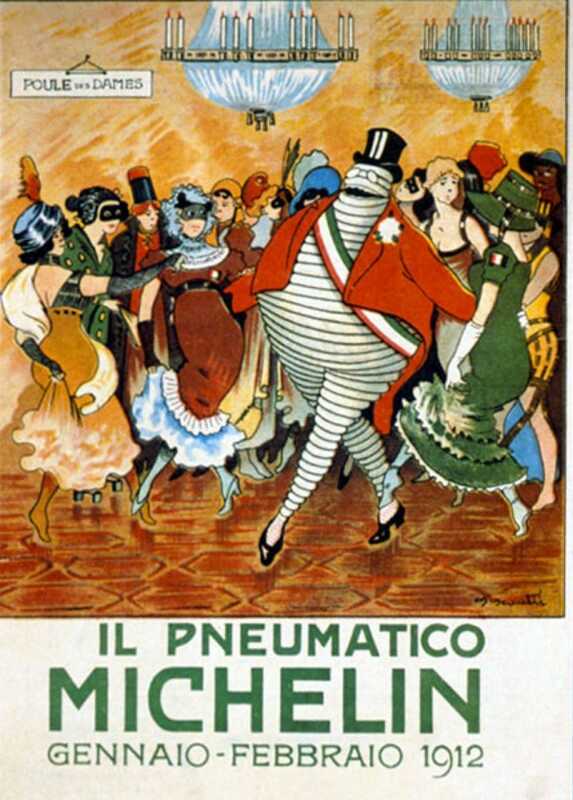 When MICHELIN launched an Italian travel magazine in 1907, Bibendum was given a regular column to pen his thoughts. In an article, he reported on a Ball of Nations he had attended, and praised ladies representing various cultures, with a particular fondness for Italy: "Oh you sublime Madonna, Rome's destiny, accept my homage, you whose eyes shine with the splendors of the Renaissance." It wasn't all love letters, though. In another fiery excerpt, Bibendum trumpeted the crushing impact his social conquests were having on his rivals, calling them "ashen-faced suitors with fixed smiles, living symbols of a shattered illusion." In more recent years, Bibendum has made a guest appearance in the French comic book series, Asterix, as a chariot wheel dealer, and starred in the 16-minute animated French short titled Logorama, which won an Oscar in 2010. 7. He's so well-loved, he's even got furniture fashioned in his image. Creator Eileen Gray crafted a plush, comfortable seat known as the Bibendum chair in the 1900s and it is still widely recognized today as one of the 20th century's most distinct furniture designs. 8. A London restaurant pays tribute to him. 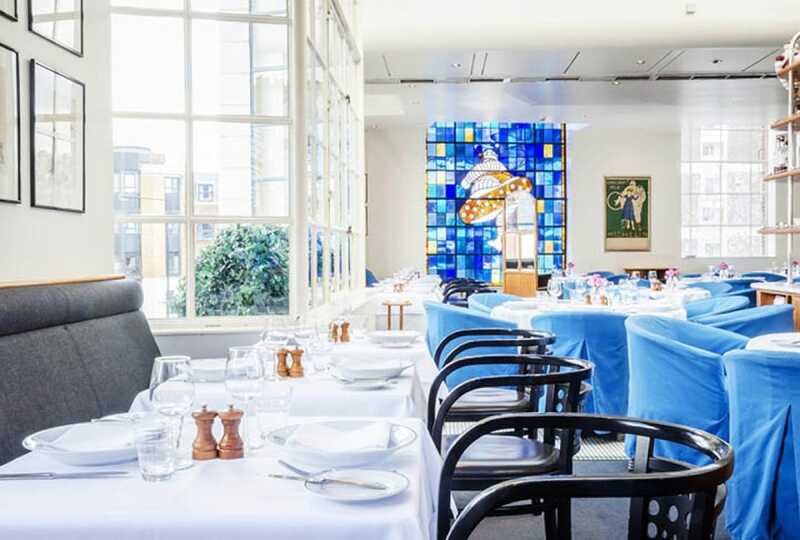 Opened in 1986, Bibendum Restaurant and Oyster Bar in London's Fulham neighborhood is a joint project by prominent British restaurateurs Sir Terence Conran and Lord Paul Hamlyn. The two men acquired the unit within the Michelin House, a specially commissioned art deco building that served as MICHELIN’s headquarters from 1911 until the company relocated in 1985. The front of the building was originally a tire-fitting bay for passing motorists, and restaurant diners today are still greeted by mosaic floor tiles showing Bibendum holding a goblet of nuts, bolts and other hazards, as well as a dramatic backdrop of stained glass windows portraying him as a kickboxer and a cigar-puffing cyclist. Unsurprisingly, the restaurant is listed in the MICHELIN Guide UK's 2016 edition.